Master Bath Remodel -- Yes or No? A friend asked me the other day to settle an argument. She and her husband and family moved into a different home a couple years ago and plan to stay for a while. Thinking far ahead to eventual resale value, one spouse thinks they should remodel the guest bathroom in the lower level, while the other thinks that the money would be better spent on the master bath. 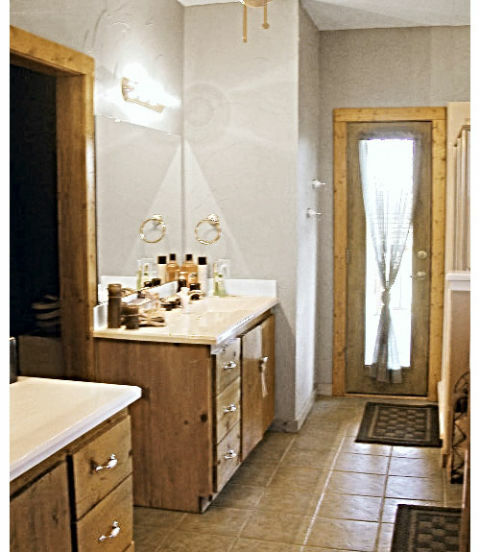 Turns out that the money spent on a master bath remodel is a much better investment. For a few reasons. One, if you are going to stay in the house for a while, why not spiff the place up the way YOU like it? Investing in your own happiness and pleasure is usually a good idea. Two, the quality of the master bath is a deciding factor in most home purchases. Time and again, I have seen buyers fall in love with a home after stepping in to the master bath, or deciding against a listing because of it. If buyers like the house by the time they get to the master bath, most other things will be immaterial. If the bathroom is good, then the paint color in the kids’ bedrooms or the quality of the carpet, or any number of other cosmetic things will no longer matter. The converse is also true. If the master bathroom is a walk through and the size of a closet and they are looking for a master suite, nothing will make the house a winner for these buyers. Even if the guest bathroom rocks. So, bottom line. If you are planning on moving in a few years and want to get it ready now for resale, consider doing some things that you have always wanted, especially if one of those things is a master bath re-do. You will be happy in your remodeled space for the next few years, and it will show great when you finally are ready to sell. Do you have more questions like this, but aren’t planning to move any time soon? Ask me! Because whether you are planning a move now or in the future, I would like to be of service. And, if you are ready to consider a bathroom remodel, whether it’s just small changes or knocking out walls, please contact Patty Farris of Designers Within. She will do an awesome job for you!